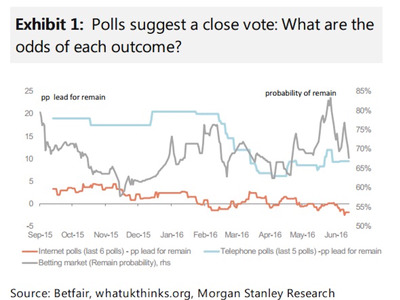 Recent polls show that a Brexit is becoming more and more likely but, according to analysts at Morgan Stanley, the outcome is far from certain. The release of a poll on Monday night showed another substantial lead for the Leave campaign. 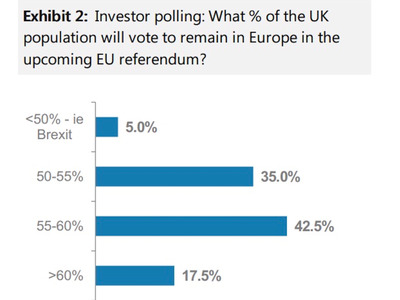 The online and telephone poll, conducted by ICM on behalf of the Guardian has the split at 53% for Leave, 47% for Remain. 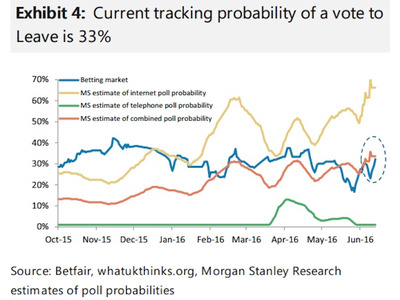 But, Jacob Nell and his team at Morgan Stanley point out that the the “poor recent track record of polls and political betting markets” as well as the lack of a historical precedent means that it’s not all over for the “Remain” camp yet. 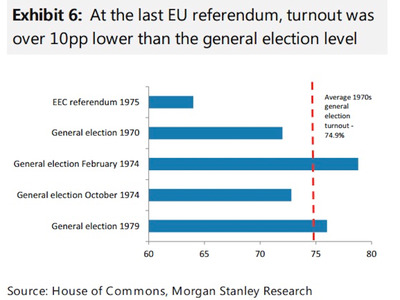 Morgan Stanley pointed out that polls are unreliable, as demonstrated in the last General Election. It said that whether the vote for a Brexit is in the lead or 'Remain,' they are always just a few percentage points within each other. Analysts also say that investors don't seem to be too worried. 'Maybe it's exhaustion over 'political false alarms' in Europe, or confidence that this is an issue that markets can take in their stride,' say analysts. The latest polls have showed that support for a Brexit is growing and Remain voters should be seriously worried. 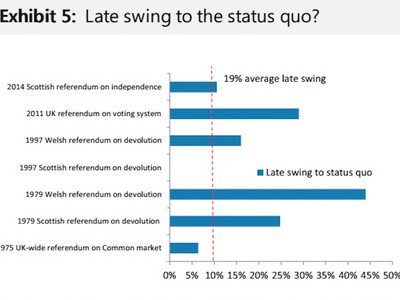 But as my colleague Adam Payne pointed out, British history tells us that support for the status quo option almost always increases in the days before a referendum. Plus it also depends on turnout. Lynton Crosby, the political strategist behind Prime Minister David Cameron's election victory in 2015 recently said that the 'Leave campaign has a turnout advantage over the Remain campaign' -- meaning Remain needs lots of people to turn up to polling stations.